There are a few species to choose from, but most go under the standard moniker of kuhlii (or coolie) loaches. In small numbers this is not a fish you’ll see frequently, but crank up the amount and you’ll often see one flitting from place to place, especially when their culinary favourite – the bloodworm – is on offer. Sometimes the real treat fish are the ones that you have to work for, and aren’t in your face all of the time. 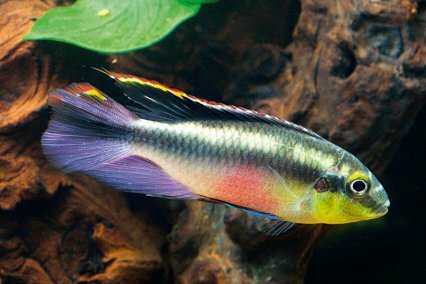 We’ve all seen the myriad colour forms of swordtail, but nothing will ever compare to the true wild markings of these fabulous fish. As well as having a subtle, less garish beauty, they are actually sturdier than their manipulated counterparts, showing better immunity to illnesses and better resistance to adverse water conditions, should that problem ever arise. 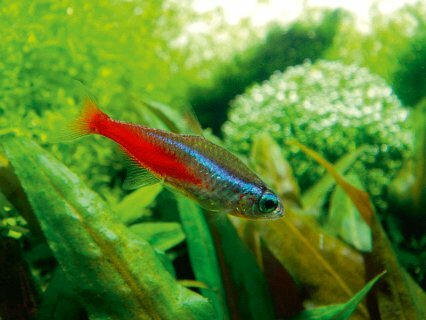 Tetra-sized, peaceable and in the case of N. beckfordi sporting bright hues of red, these fish will be the last to cause trouble in a community. 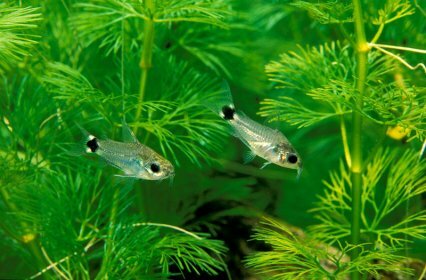 Sometimes shy, they do well in small to medium shoals, and are an excellent addition for anyone who leans towards the plant heavy side of community aquaria. Keeps an eye out for the more expensive but breathtaking N. espei if you can. Pic shows N. rubrocaudatus, courtesy of Rare Aquatics, Cheshire. Rivalling the larger Trichogaster gouramis for attractive markings, this humble and small anabantid will find a home in any peaceful community. Sadly, these fish are often sold from tanks with little décor or planting, and refuse to develop their full colours. They remain a prize for anyone willing to take a gamble. Get them into a quiet tank with a few plants about and watch the colours bloom. Picture by George Farmer. 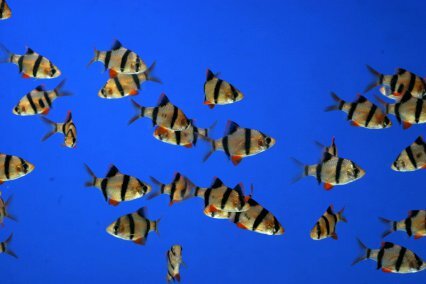 I’m not joking here, the Tiger barb can be an excellent fish in the community. Myths and rumours abound about nipping behaviour but this is a fault of the keeper, not the fish. Kept in large enough groups, these fish will be gregarious amongst themselves, but this boisterous behaviour will not spill over to other tankmates. Don’t mess about with numbers and opt for a shoal of a good 12 or more for a well-behaved and active community fish. All too often I’ll see a token three corys in an aquarium, usually bronze or peppered variants. Why not go for something a little smaller and shore up the numbers? These little cats go great in some of the dinkier communities that are appearing, doing much the same job on a smaller scale. In larger numbers the fish will be happier, and these little chaps definitely seem to shoal more and remain in groups than some of their larger counterparts. A peaceful cichlid that actually becomes less shy if it has small tankmates. 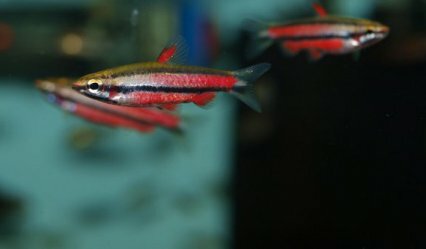 Fin markings and colourful bellies make them pleasing to the eye, and for the novice breeder they represent an excellent starter species to cut your teeth on. At just 10 –12cm long they become large enough to become a focal centrepiece, without being so large that they dominate the aquarium. Sharing the intensity of its larger siblings, this is a fish that is incredibly active, easy to feed, able to recognise its owner (read, 'feeder') and only interested in interacting with its own kind. For a curious and inquisitive fish that plays in flows and currents and sports the most intense blue colouration, look no further than this fish. There’s even a subtle difference in fin colours between sexes, allowing you to keep tabs on who’s who. The second rainbow to grace this list, the Forktail is prime example of a fish that develops at home. 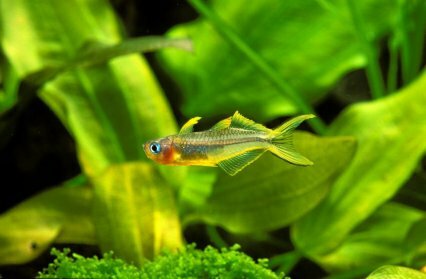 Often appearing expensive and bland in stores, within a few weeks of settling into a home tank they start to develop dazzling yellow fins unrivalled in the freshwater world, that offset their subtle blue eyes. Far from shy, and simple to cater for, these fish soon become firm favourites with keepers racing back to buy more once they witness the potential this species has. Not so much underrated by the beginner aquarist, as these are one of the most popular fish in the UK, but I would strongly suggest to many old salts that you give this fish a second look. 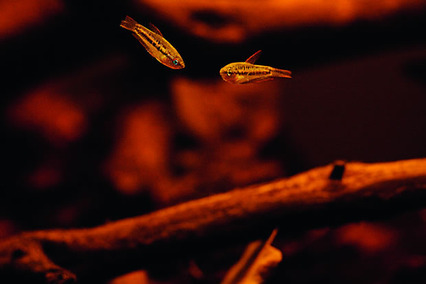 Upon doing the rounds of fish that are difficult, obscure, or near impossible to breed, nowhere near enough experienced aquarists give this fish the time of day, and this is a great loss. I myself have come full circle back to this fish, appreciating its timeless appeal, and I strongly regret not giving this fish the time it deserved earlier.